Of the many kinds of sacred spaces that one finds in contemporary America, children’s playgrounds remain the most robust. 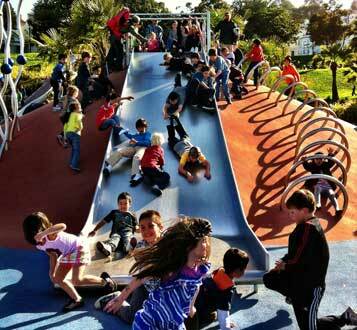 And within the Bay Area, the high temple of them all must surely be the Helen Diller Playground at Dolores Park. Spending an hour enshrined there on a quintessential Bay Area afternoon–low 70s, light breeze, cloudless (for now)–absorbing the ambrosia of children’s laughter, marveling at the invincibility of their rubber-band bodies, one does begin to wonder what god realm this is. I wondered just that the other day, scrambling and shouting after a dozen Oakland ten year olds, who, unfazed, sprinted out in front of me. They didn’t even pause to search for the entrance: careening haphazardly over the wall that surrounds the play structures, a moment later they had dispersed and dissolved into the collective ecstasy that haunts this place from dawn to dusk every sunny day of the year. Huffing and puffing, I descended from the stone wall and was nearly blown back by the delta waves of fun. For a moment, just imagine all that fun. They ran experiments and the Super Slide alone gives off 21,000 megafuns per hour in the summertime. Hecka fun. Vajra Fun. Children of all ages and colors were frolicking, screaming their heads off, falling over, bouncing along, and getting back up from the mysterious and now ubiquitous vulcanized substance that covers new playgrounds, revolutionizing the gravel of yesteryear (how poignantly I recall searching for a lost tooth among those many white and yellow pebbles). One of my charges, solemn with fun, came up and handed me his “Heelys,” the little wheels that live in the soles of his shoes and that have revolutionized walking, and told me that he had already been down the Super Slide three times. “But that’s not even possible,” I mused, for we’d been in the playground only a minute. This was no place for such conceptualizations: “This time I’m going to ride down on my stomach with hecka sand in front of me!” he cried, returning to the glinting slide that towers over the playscape. Relinquishing any hope of managing my charges, I took a brief tour of the holy space. Its sanctity is strictly maintained: a man excused himself to answer a phone call, and just outside its gates an entire cadre of grim-faced ice cream vendors stalk like so many Hindu florists or Russian icon painters. Inside, everywhere the children speak in exalted tongues, incomprehensible to us humbled adults. They sing in tongues by the Play Pipes upon which the holy and atonal songs of children are banged out; they wail in tongues on the Wall That Must Be Climbed; and they cry in tongues as they soar on the Swings of Ecstatic Experience and hurry over the mystical Bridge to Happiness. A layman in a cathedral, a pilgrim in a foreign land, I bowed my head and smiled. By Reese Sweeny-Taylor for the Ziji Collective.